The U.S. Federal Communications Commission should cap the participation of carriers AT&T and Verizon Wireless in upcoming spectrum auctions to ensure mobile competition going forward, representatives of consumer groups and smaller carriers said. Contrary to the assertions by the two largest U.S. mobile carriers, a limit on their participation in auctions of the television spectrum in 2014 or 2015 will not lead to lower spectrum prices, said speakers at a Thursday spectrum forum sponsored by the Competitive Carriers Association (CCA) and the Computer and Communications Industry Association (CCIA). If Verizon and AT&T are allowed to bid without restrictions in the upcoming 600MHz auctions, smaller carriers would likely be scared off, said Stanley Besen, a senior consultant at Charles River Associates, an economic consulting firm that has advised Google recently. The FCC needs to ensure a competitive marketplace moving forward, said Chip Pickering, a former Republican congressman from Mississippi and now a partner in Capitol Resources, a lobbying firm. “Functioning, free, competitive markets give us greater growth, greater investment, greater innovation, greater consumer benefits, and they cause our economy to grow much more than monopoly ... markets,” he said. Even though the spectrum auction may be two or more years away, and it’s unclear how much spectrum television stations will voluntarily give up, consumer groups and small carriers have been working for months to get the FCC to limit participation by AT&T and Verizon. The debate heated up last month, when the U.S. Department of Justice jumped into the fray by also calling for auction rules that encourage smaller carriers to acquire the vacated TV spectrum. AT&T, in a response to the DOJ letter, said the DOJ is encouraging rules that would “rig” the auction results for Sprint Nextel and T-Mobile USA. Bidding limitations that favor the two smaller carriers are “at odds with the competitive bidding process” required in U.S. law, wrote Wayne Watts, AT&T’s senior executive vice president and general counsel. Sprint and T-Mobile both have significant spectrum holdings already, Watts wrote. But AT&T and Verizon control 78 percent of the spectrum below 1GHz available for mobile service, said Mark Cooper, director of research for the Consumer Federation of America. Spectrum below 1GHz is considered the best for high-speed data services because the signals travel farther and penetrate buildings easier than spectrum in higher frequencies, participants in the Thursday forum said. 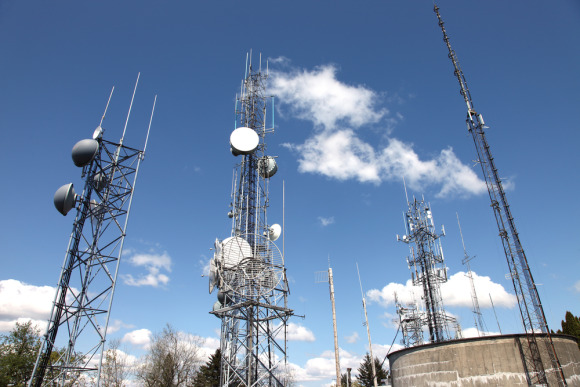 It would take eight cell sites in the 1.9GHz band to cover the same area as one cell site in the 700MHz band, and 13 or more cell sites to cover the same area in the 2.5GHz band, according to information from CCA and CCIA.